If you suffer from arthritis, leg, hip, or back problems or deal with the frustration of limited mobility, getting in and out of a vehicle can be challenging. Our car swivel cushion resolves this issue, allowing you to easily move in either direction without worrying about pinching yourself or your clothes. The swivel car seat cushion is designed to rotate 360 degrees, so you can use it on both the driver and passenger side of a vehicle. 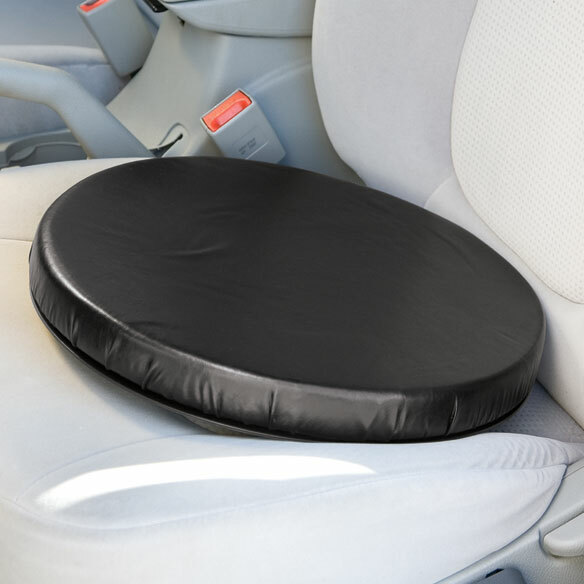 In addition to making vehicle entry and exit simple and painless, the deluxe swivel seat cushion features a comfortable, padded seat that is perfect for long trips. You’ll be able to move independently and enjoy added comfort on every drive. 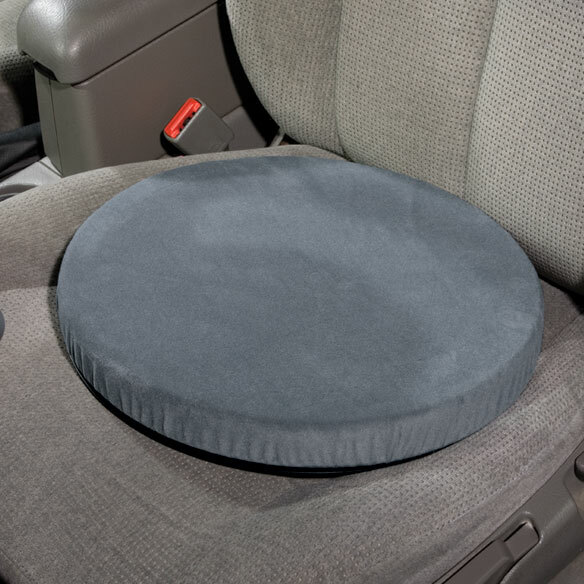 This swivel cushion for car seats measures 15” at the base, and can support up to 300 lbs. Overall measurements are 1 ¾” high x 15” diameter. It's easier for my mom to get in and out of the car. Added a pillow on top of it for softess. Still have to reposition it before I sit down, since it doesn't fit the contour of the bucket seat. Maybe could be a bit smaller. My elderly Mother finds it easy to get in and out of a car using the swivel seat. I have been using a pillow to boost me up so I can see over the steering wheel when I drive. The pillow has died, sigh. This swivel seat cushion is exactly what I wanted and needed. No more straining to see over the steering wheel and the swivel function helps me get in and out with much less effort. Thanks for the cushion! This makes it so easy to get in and out of my car. Being disabled, this helps me to maintain my independence. I ordered the Swivel Seat Cushion to use in the car. When I am a passenger I have trouble sliding in the car seat. I can just sit and turn on the cushion and I am comfortable. It is a nice color and fabric. I would recommend it to any one especially someone who has had hip surgery and has trouble getting into the car seat. I think it would also be good for other uses in the home, such as in a dinning chair. Too large for bucket seat on cars & riding lawnmower. It won't turn, except on flat surface. Because I think it will serve the purpose I want it for. To make it easier to exit and enter my car. size to fit in car seats. I like that the black leatherette will match our car interior, while comfortably assisting me out of the SUV. Seems very helpful for people with mobility problem. Nerve problem in left leg. I have a back problem and though it might help. Tomake it easier for my husband to get in the truck. A little bit thicker than others. Have a need for just this exact swivel cusion! Hope it will help getting into the car. Looks good and the price is right. I am recovering from hip surgery and I think this will ease entry into my car. I'm having trouble getting in & out of car. I've been having difficulty getting out of the car. I've had 2 total knee replacements and I'm having a hard time getting out of the car. So I'm hoping this works! Need assistance getting in and out of personal vehicle. I have an elderly mother who has a hard time getting in and out of the car. I am hoping this will help. My friend has lost use of one leg and I hope that this product will help him get in and out of his van more easily. This cushion had the best reviews of all the ones I researched. my mother has a hard time getting in and out of cars. I hope this makes it easier for her. My husband has limited mobility and I think this item will help him get in and out of the car. to help placing patient in car but it didn't work at all. For my Mother In-Law to make her life better. IIs the swivel cushion a foam cushion? BEST ANSWER: Yes, it does have a foam cushion. The bottom is plastic and it has a removable microfiber cover. It is foam, but not soft. It does not work on bucket seats...requires a flat seat. Is this a foam or gel cushion? BEST ANSWER: I sent it to my mom, so it is not within my possession. I am sure it is foam. I know one thing, My Mom loves it. It is a firm foam and very comfortable. what type of material (s) (and the percentage of each) is in the cushion ? Memory foam, polyurethane. etc.? BEST ANSWER: Thank you for your question. The base is plastic and the cover is polyester. We hope this information will be of help to you.